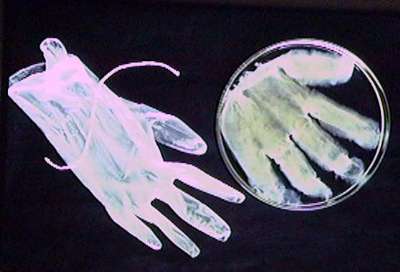 The Acetobacter cells produce and exact cellulose replica of the PVC glove! This is due to the oxygen-rich interface at the glove surface where the Acetobacter cells survived and synthesized cellulose. This breakthrough will enable large-scale fermentation to make non-woven SHAPED cellulose! Several patents on this concept have been issued to The University of Texas at Austin.